They helped Victorian men drink tea while protecting their precious facial hair. The late 19th century was a heyday for impressive mustaches, but it presented various challenges for mustachioed tea lovers. The heat of the drink melted the mustache wax, making its corners droop. Mustaches, and their owners, were literally getting into hot water. The solution to this problem arrived in the form of the mustache cup. 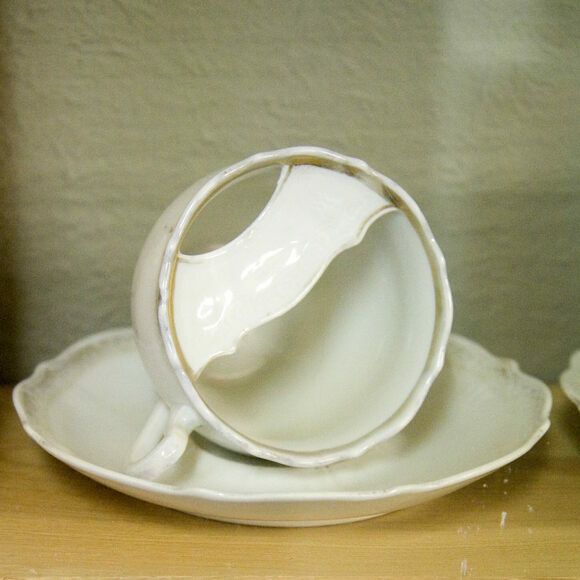 The mustache cup was almost certainly invented by the British potter Harvey Adams in the 1870s. Adams patented a butterfly-shaped ledge that was set inside the cup with a hole to drink through. These sold in great quantities, first in the UK, then throughout Europe. In the U.S., they were sold everywhere from Sears to the department store Marshall Field’s, later owned by Macy’s. These days, you’ll mostly find mustache cups in museums or private collections of Victoriana. One unexpected home of mustache cups is the Dead Rabbit Bar in New York's Financial District. Bar manager Jack McGarry serves 1870s-style punch in antique versions. While most customers don't require the mustache protector, the guard does an excellent job at holding back the ice.